You must be a member of the Mexico City Drinks Group to attend this activity. Would you like to join this group? Paella (Valencian pronunciation: [paˈeʎa]; Spanish: [paˈeʎa]) is a Valencian rice dish that has ancient roots but its modern form originated in the mid-19th century in the area around Albufera lagoon on the east coast of Spain adjacent to the city of Valencia. Many non-Spaniards view paella as Spain's national dish, but most Spaniards consider it to be a regional Valencian dish. 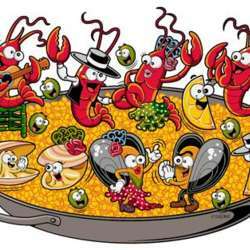 Valencians, in turn, regard paella as one of their identifying symbols. Types of paella include Valencian paella, vegetable paella (Spanish: paella de verduras), seafood paella (Spanish: paella de mariscos), and mixed paella (Spanish: paella mixta), among many others. Valencian paella is believed to be the original recipe and consists of white rice (which must be round grain), green beans (bajoqueta and tavella), meat (chicken and rabbit, sometimes duck), garrofó (a variety of lima beans or butterbeans), sometimes snails, and seasoning such as saffron and rosemary. Another very common but seasonal ingredient is artichokes. Seafood paella replaces meat with seafood and omits beans and green vegetables. Mixed paella is a free-style combination of meat from land animals, seafood, vegetables, and sometimes beans. The price includes 🍷 tasting, Paellas , the rent of the venue and tip.